You have always wanted to become a diver. You have seen the documentaries and you ask, can it really be that good? Nothing on earth, nothing you will ever experience, compares to becoming a scuba diver. From the second you experience the magic of taking your first underwater breath you’ll be hooked. As our instructor teaches you how to float weightlessly in the water you will know you’re preparing for a truly life changing experience. Whether gliding over colourful reef, being surrounded by schools of fish, interacting with dolphins or exploring a wreck from a by-gone era the adventure never stops. The RAID Open Water 20 program is our most popular certification program. You will learn everything you need to know to explore the underwater world with confidence. Your training starts online where you will learn all the important information about learning to scuba. Everything from the equipment you will use, the diving environment, the effects of depth and the skills you will learn in the water. The RAID Open Water 20 Course takes about 3 days depending on local conditions. It is recommend you own the essential items like mask, snorkel and fins. Exposure protection may be provided by us but it is highly recommended that you purchase your own exposure equipment. Before you buy, make sure you speak to us to get the equipment that is right for you. Most of the other items are generally provided for your course but make sure you ask us. Your RAID on line course includes all on line training materials which you can access for life. Upon completion you will be issued with your e-card which recognises you as an internationally certified diver. The minimum age is 15 years old. You will be required to a complete a dive medical questionnaire. If there are any potential issues you will need to complete a medical from a doctor. 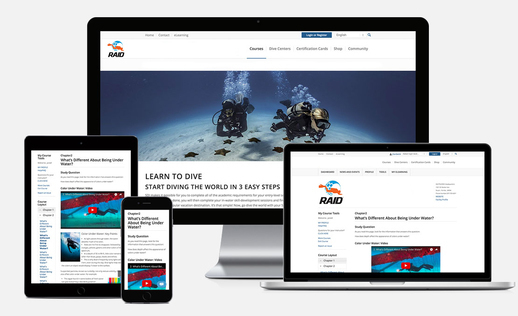 RAID Scuba Certifications are recognised worldwide. RAID programs are approved by the European Underwater Federation (EUF). The certifications you earn with RAID will be accepted by dive centers, charter operators, and dive destinations anywhere your adventure may take you! Why wait, start your adventure today with US ! As a certified RAID Open Water 20 Diver you are qualified to dive to a depth of 20 metres or 66 feet, you will be able to rent diving equipment, get air fills, go on charter dives and participate in a wide variety of diving activities. We strongly recommend you join in on our Trips Dive Community soon after the completion of your course to consolidate your skills that you have learned. You are also qualified and we recommend you join in on a RAID continuing dive education program. For a full list of RAID programs – click here!